WHEM has consistently been awarded a multi-year contract since 2004 with the Waste Management Division of the VT DEC to conduct environmental monitoring at sites in Williamstown, Brookfield, and Randolph, Vermont. The primary contaminants of concern are chlorinated hydrocarbons stemming from former releases of dry-cleaning wastes. 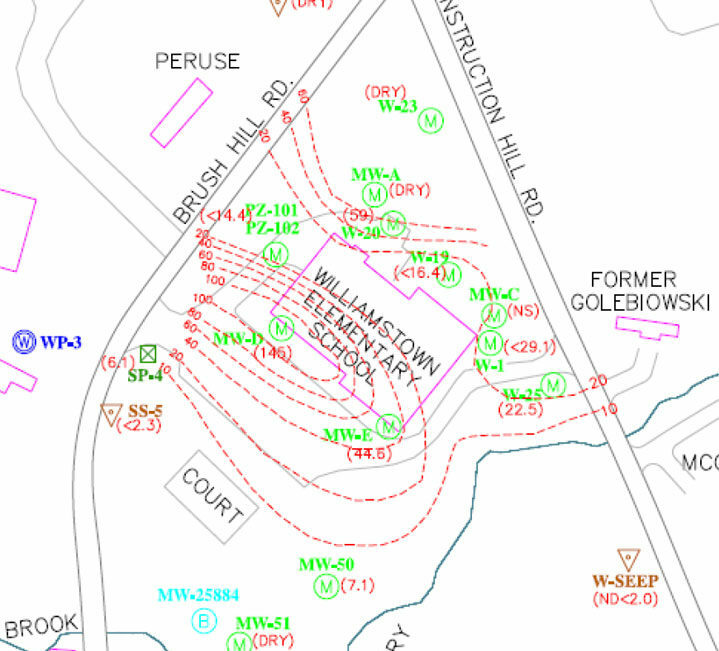 The sites include the now-demolished UniFirst Plant and surrounding impacted properties (including the Williamstown Elementary School and several private residences), and two former farmers’ fields where PCE contamination was introduced through the spreading of septic sludge from the Unifirst Plant on to farm fields. The monitoring involves sampling of indoor and outdoor air twice annually, surface water (springs and seeps) every other year, supply wells twice annually, and annual groundwater monitoring (low-flow sampling; shallow aquifer and bedrock monitoring wells). WHEM is responsible for all fieldwork, project management, data analysis, technical reporting, and database management. Fieldwork and data analysis performed for this project undergo elevated scrutiny from VT DEC site managers and legal counsel, in addition to consultants representing UniFirst; therefore, all work is conducted with careful attention to detail and a high level of redundancy. Brownfields team member Deborah Gaynor, PhD, of Phoenix Chemistry Services provides data validation of all laboratory reports for this project.